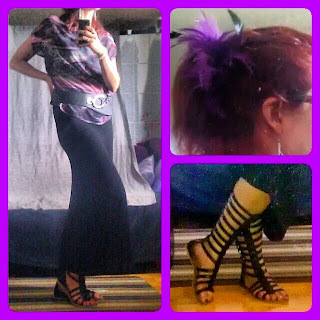 The Purple Scarf: Style: New Outfit Styled! Heya! Check out a new outfit I created with some old pieces from my closet! If your closet is like mine, you have a lot of great items that are a few months (or years) old. All you need is some creative thinking and try to pair some of those pieces together to create a whole new outfit! The black tank dress is a basic that most women have in their summer wardrobe, and put that underneath a bright patterned sheer blouse with a fabulous belt and trendy sandals (like the gladiator ones I got on clearance at Urban Outfitters) and now I (and you) have a fabulous new summer outfit! And P.s! : Add a fun accessory to your hair (like my purple feathers) to give your hairstyle a quick update too!